The year over year home sales report compares a month against the same month last year. It is a more effective way of looking at housing market performance. 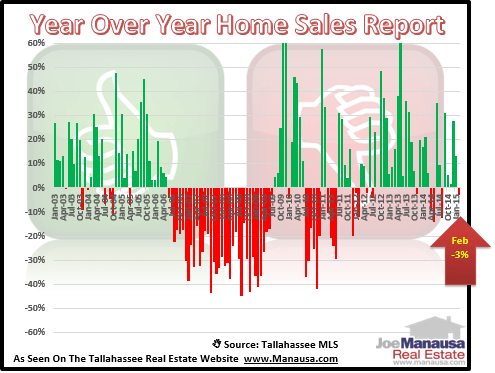 If Tallahassee saw more homes sold in March than in February, for example, but but fewer than in March of last year, then we might be lulled into thinking that home sales were improving when in fact they were not. The improvement might simply be because home sales do better in March. They say that knowledge is power, and both buyers and sellers can put some extra money in their pockets if they know how to use this information to their advantage. One of the advantages of year-over-year comparisons is that it automatically negates the effect of seasonality. For example, January and February home sales are always the lowest of the year. A month-to-month comparison would show a huge increase in March and could make us believe the market was getting better if you didn't know to take the seasonality into account. Year-over-year comparisons reveal a truer picture of the housing market. In fact, there were 63 more homes sold in March of 2014 than were sold in March 2013, a positive move for the market. Additionally, March represented the 20th month in a row that this report was positive! A big mistake that I see made all the time, by both home sellers and home buyers alike, is that they do not know "where they stand" in the negotiation. Uninformed buyers want to come in too low and most sellers want to ask more for their home than it is worth. Our chart above tells us that the market is growing stronger every month. That means there is a positive growth trend and that more buyers are in the market today than there have been in the recent past. Therefore, buyers need to understand that they have more people competing to buy homes than what they might have heard in the past. If a buyer does a thorough search for a home in a highly liquid price range (anything between $100,000 and $400,000 in Tallahassee) and finds one that really stands out from all the others, then she better make a strong offer. The year over year report is telling her that competition among buyers is picking up, and what are the odds she is the only one that thinks the house she found is worth buying? Similarly, home sellers can take this information and use it to their advantage. It wasn't long ago that property values were dropping in all price ranges, and home sellers had to price their homes lower and lower to attract a buyer. But this increase in buyer activity has helped turn the tide, and home sellers are now (in highly liquid price ranges) seeing home values move higher. This means that if they want more money than their house is (currently) worth, all they have to do is wait and the market will come up to them. Additionally, if they receive an offer that is lower than what their real estate agent tells them their home should sell for, they can confidently counter the buyer's offer at a higher price. The market is moving in their favor again. You don't have to over-pay for a home, and you don't have to sell your home below market. But that is what many people do, all because they fail to perform a critical "first step" in the real estate transaction process. Take the time to interview enough agents until you know you are working with a trained negotiator. In Tallahassee, it usually equates to about roughly 4 or 5% in working with a trained negotiator versus the typical un-trained real estate agent. You will likely spend the same amount on fees either way, so why not hire the best to take care of your best interests? If somebody can not brief you on current trends in the housing market, how can they know where you stand in the negotiation? Make them show you current graphs, trends, and analysis and look to see that they are confident in understanding how this will impact your move. If you are thinking about buying or selling a home in Tallahassee, just drop me a note and we can schedule a time to show you a process that will save you money.